The Comark FG80AK Fridge and Freezer Thermometer can be used in a variety of fridge/freezer types from walk in to stand alone. 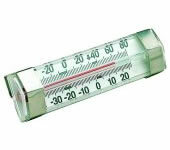 This thermometer features a dual scale in bold type to allow you easily monitor the temperature in the measurement that you prefer to work with. Our FG80AK fridge & freezer thermometer by Comark can be mounted either horizontally or vertically and are suitable for both home and professional use. Temperature trace very hard to read, and temperature reading seems inaccurate. Even at this price very poor value. compact, easy to read and clips onto shelf. Thanks for a very swift delivery. My devices are in place and have already taught me vital information about my kitchen. Fit for purchase delivered quickly.